A bit of blue and a lot of nylon. 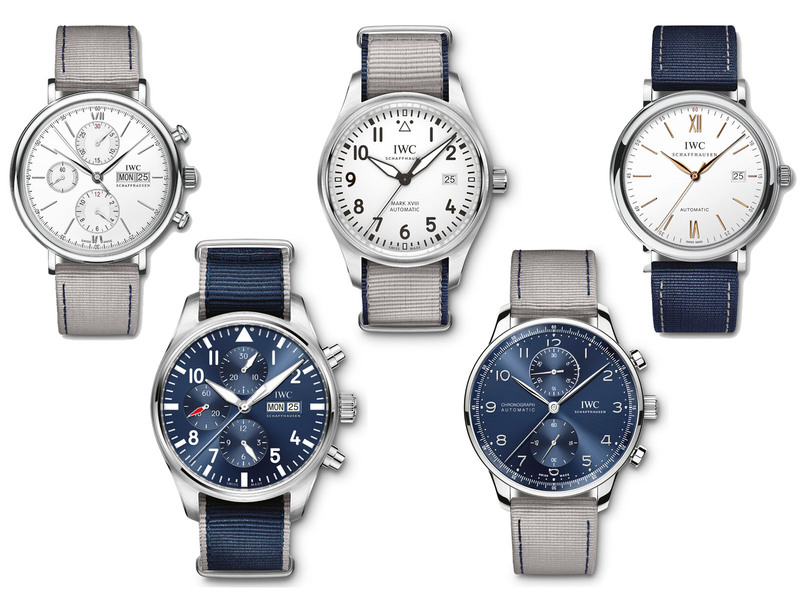 IWC is going seasonal with a new watch, and plenty of fabric straps, for the summer. Resembling the Portuguese Laureus edition of 2013 a fair bit, the new Portugieser Yacht Club Chronograph Summer Edition is in stainless steel with a deep blue dial, white registers and a few red accents. But unlike the Laureus edition that was a first generation Yacht Club, the Summer Edition is a thinner and smaller second generation, with a diameter of 43.5mm. 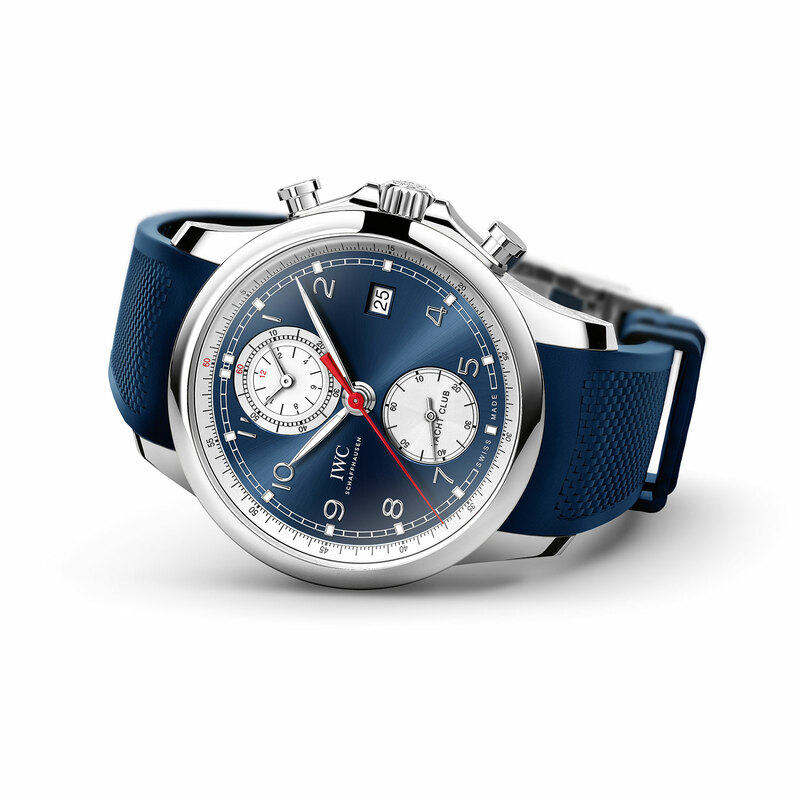 The Summer Edition features a vertical configuration that’s characteristic of IWC’s in-house chronograph calibre, which boasts both a flyback and a co-axial hour and minute counter at 12 o’clock that gives the dial a clean, symmetrical layout. The cal. 89365 has a 68-hour power reserve and IWC’s Pellaton winding mechanism. With its seagoing theme, it stands to reason that IWC has fitted the Summer Edition with a blue rubber strap. However, the brand is also offering a collection of fabric straps in blue and grey as optional accessories for its bestselling models like the Pilot’s Watch Mark XVIII and Chronograph, the Portofino Automatic and Chronograph, as well as the Portugieser Chronograph. The straps will only be available for a limited period of time. 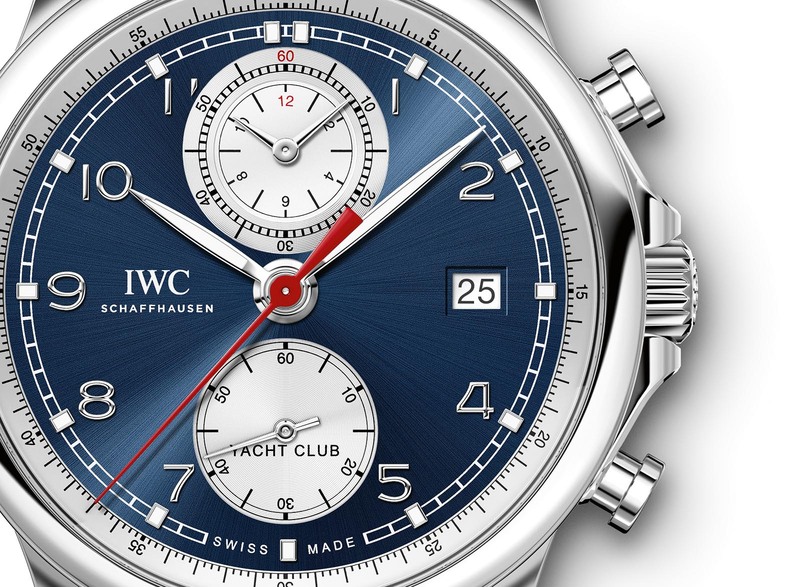 The Portugieser Yacht Club Chronograph (Ref. 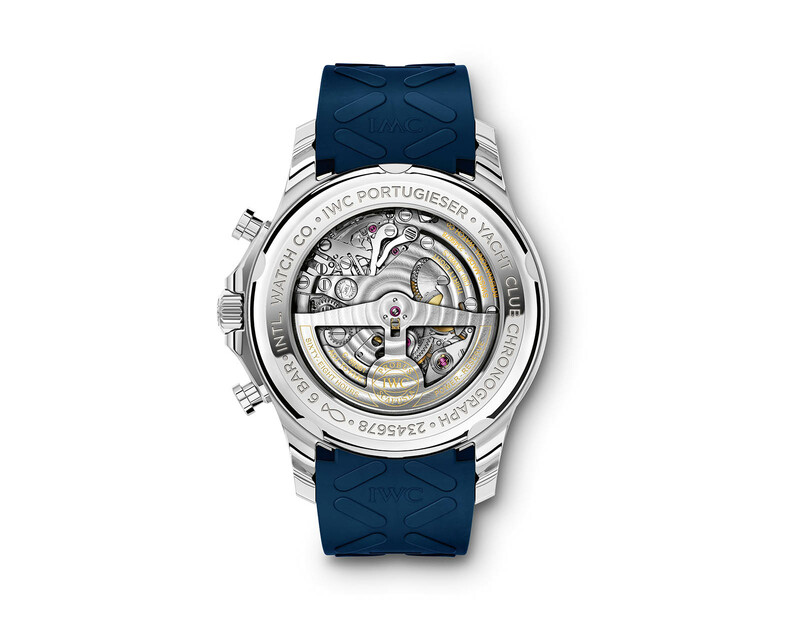 IW390507) is priced at US$12,100, or S$17,900, which is the same as the regular edition of the model. The fabric straps start at about US$120 or S$170. 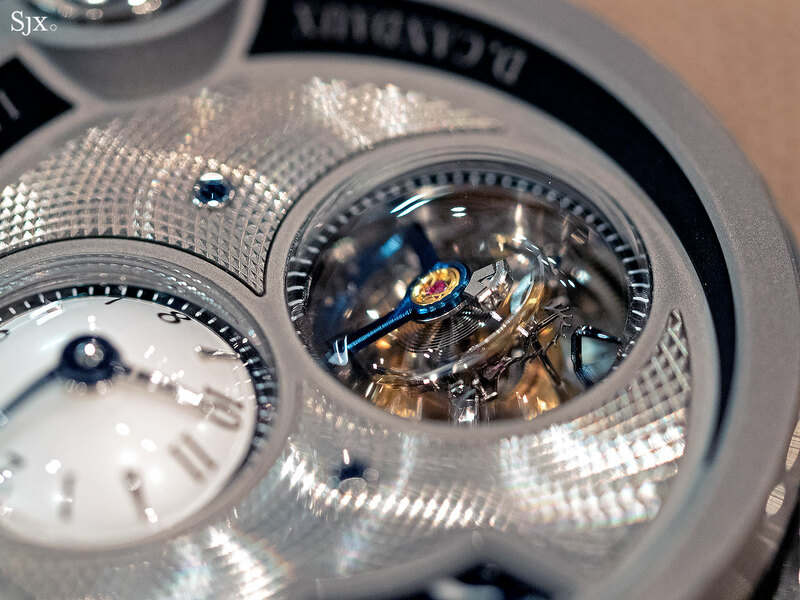 A unusual watch from the traditional heart of watchmaking. Best known for having spent nearly 20 years as a constructor at Jaeger-LeCoultre, David Candaux is a watchmaker whose current creation is heavy in historical references. The 1740 wristwatch is named after the year a watchmaker (named, what else, but Meylan) first set up shop in the Vallée de Joux, the historical centre of movement and component production. 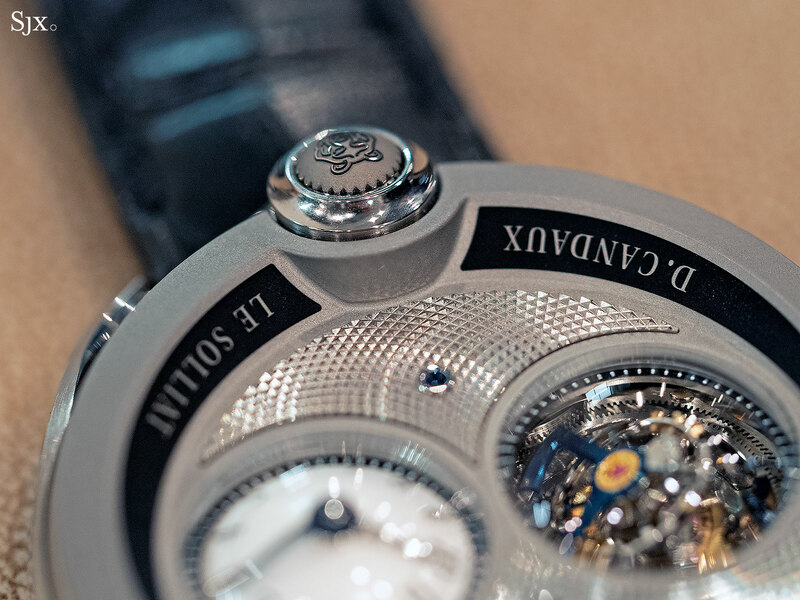 It is also where Mr Candaux was born, the third generation in a family of watchmakers. Despite all of that the watch is a thoroughly modern creation. It’s an unusual watch with unusual details that nevertheless manages to incorporate elements and techniques of traditional watchmaking. The 1740 Half Hunter is the second iteration of the 1740, being the first in titanium. The lightweight case alloy, along with the redesigned, slightly open-worked lugs, make this the most contemporary of all the variations. 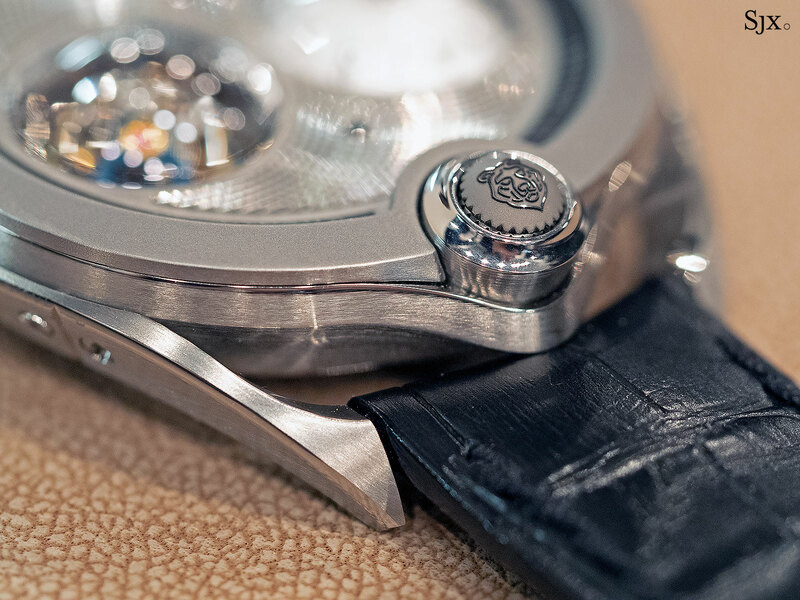 Titanium works well because the 1740 is a largish watch, with a diameter of 43mm and slightly longer vertically. It’s also 12.6mm thick, though the measurement is deceiving as the case is slightly inclined – higher at 12 o’clock and gently sloping downwards – due to the inventive movement construction. The most unusual is the telescopic, retractable crown at six o’clock. Gently pressing it inwards causes it to pop out, allowing for winding and setting. It’s set at a slightly angle to the plane of the movement. The inclined plane continues on the movement itself, with each of the horizontally positioned bridges sitting slightly higher than the other in a stepped formation, with the bridge at 12 o’clock being the most elevated. In fact, the bridges, wheel train and gears are inclined at 3° from the horizontal; they are all on the same plane and inclined at the same angle. 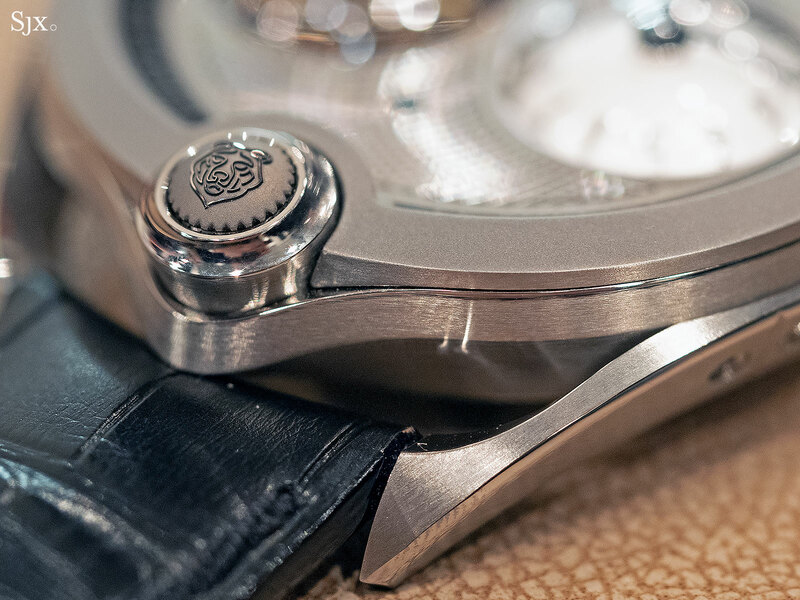 Over on the front, the dial is covered in an hobnail guilloche plate made of 18k white gold. 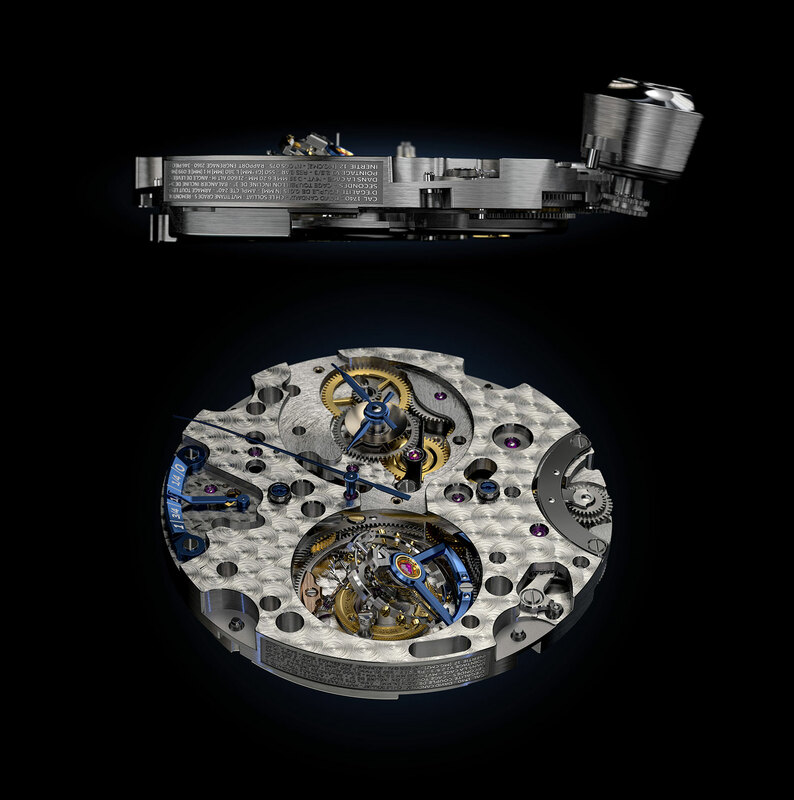 The time is at three o’clock, the tourbillon at nine – both under sapphire crystal bubbles – and the power reserve at 12. 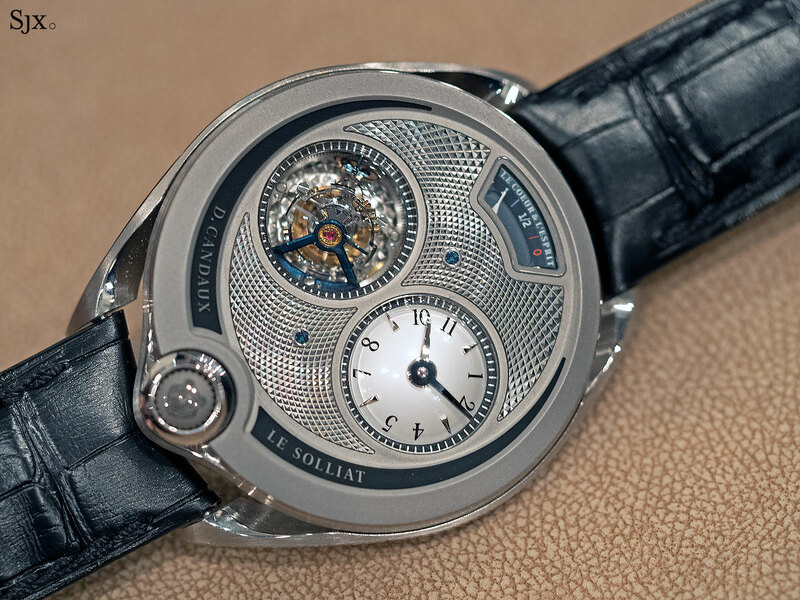 Named the “bi-plan” tourbillon, the regulator is actually an inclined tourbillon, with both the balance wheel and tourbillon cage positioned at an angle against the horizontal plane. The name stems from the double incline of its construction, one for the base of the tourbillon and another steeper angle for the balance wheel. Conceived to cope with gravitational errors due to the constantly changing position of the wearer’s wrist, the inclined tourbillon is not a new idea, having been executed by Greubel Forsey as the most prominent proponent. It is particularly striking in the 1740 though, with the blue-coated titanium cage rising up from the dial. Upon close examination the balance wheel reveals itself as eminently traditional, featuring adjustable gold masses and a hairspring with a Breguet overcoil and Phillips terminal curve. 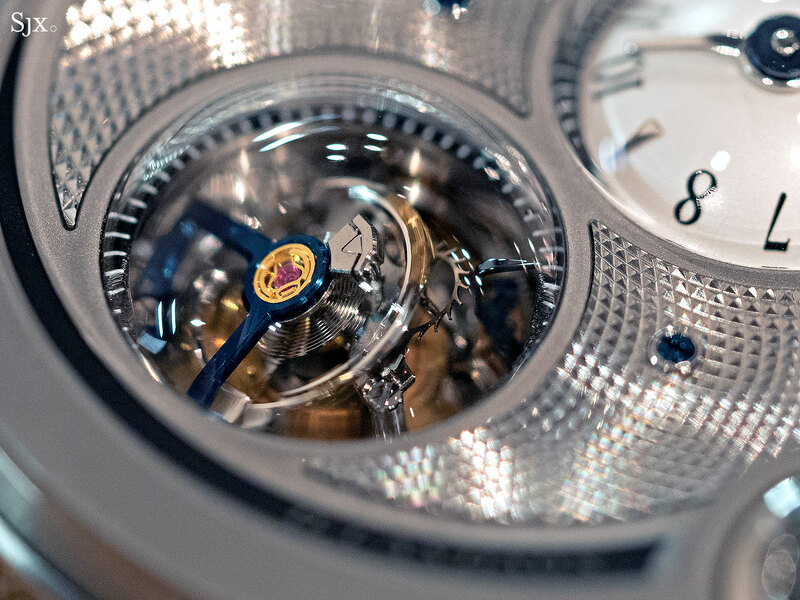 To the right of the tourbillon is a domed dial with curved hands, mirroring the shape of the tourbillon. The hands, naturally, are blued and polished by hand. 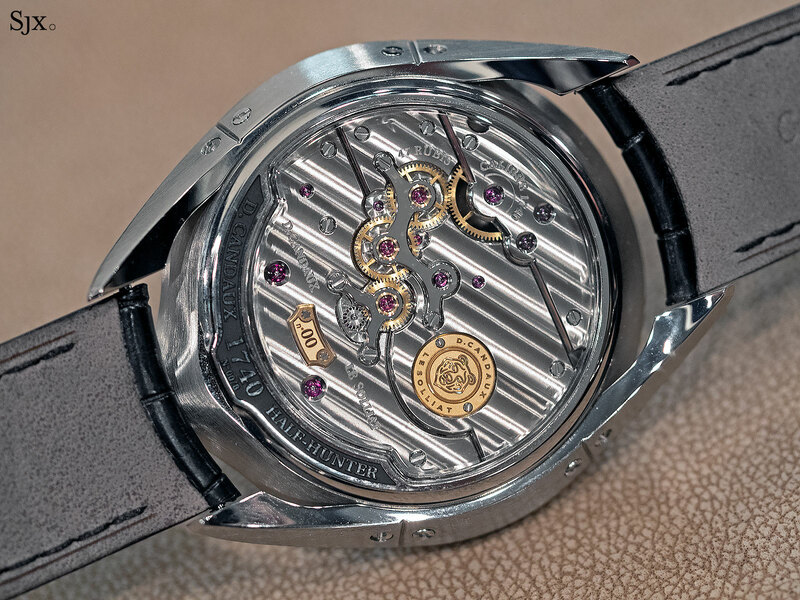 And the 55-hour power reserve is indicated in a fan-shaped aperture at high noon via a pointer in 18k white gold, the same material used for the centre seconds hand. All of the mechanics sit on a titanium base plate that have the specifications of the movement laser etched in relief on its side, tiny script that is invisible to anyone but the watchmaker taking apart the watch, meant to be a message to future watchmakers explaining how to service the watch. The stepped bridges are also made of titanium, and finished with Côtes du Solliat, a variation on Geneva striping invented by Mr Candaux. While conventional Côtes de Geneve are narrow stripes equally spaced, Côtes du Solliat relies on wide stripes that are widely spaced, creating the optical effect of each stripe being comprised of several sub-stripes. Perhaps because of the hardness of titanium compared to traditional German silver or brass, the striping does not seem quite as pronounced. 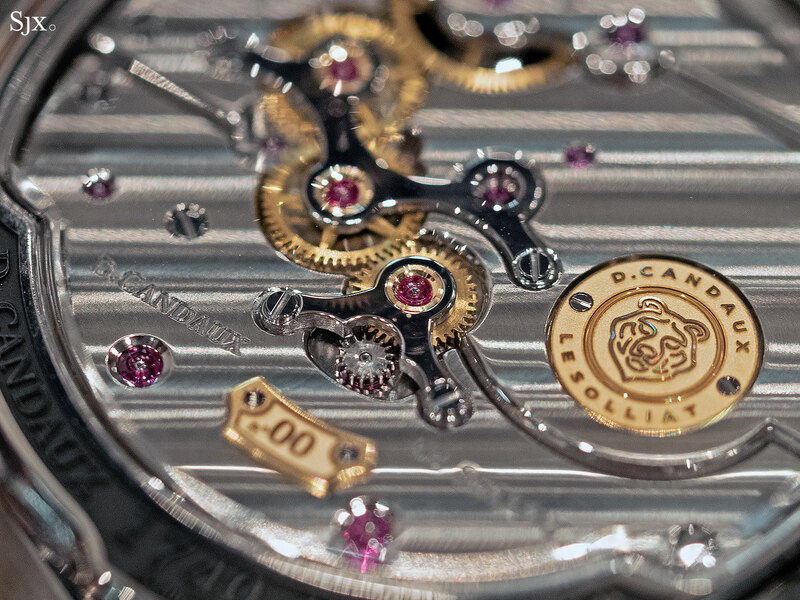 The rest of the movement is equally elaborately finished, including polished and chamfered inward angles on the bridges, black polished screw heads and bridges, as well as gold chatons for some jewels. It is obvious thought has been put into giving the movement decoration that is both elaborate and visually striking. Equal effort has been put into finishing the case, which has alternating brushed and mirror polished surfaces. The gently curved lugs are its most beautiful feature, appearing almost as rails supporting the “bassinet” case. The 1740 Half Hunter is priced at SFr235,600 before taxes, or about US$240,000. It’s available direct from Mr Candaux.